Delvalle presents his new range of products Atex LED lighting. All our products are designed and manufactured internally according to different methods of protection such as “Ex d” flameproof, “Ex e” increased safety, “Ex de” mexid and “Ex n” no sparkling. Energy savings. With the same illumination, LED technology allows to obtain an efficiency of at least 10% compared to traditional lighting sources. In addition to a lower consumption with an equal illumination, it’s not necessary to use filters as the light emitted is already colored, monochrome and, therefore, particularly bright. A great advantage if you consider that, for example, in the case of red colored glass, only 20% of the light emitted seeps through. 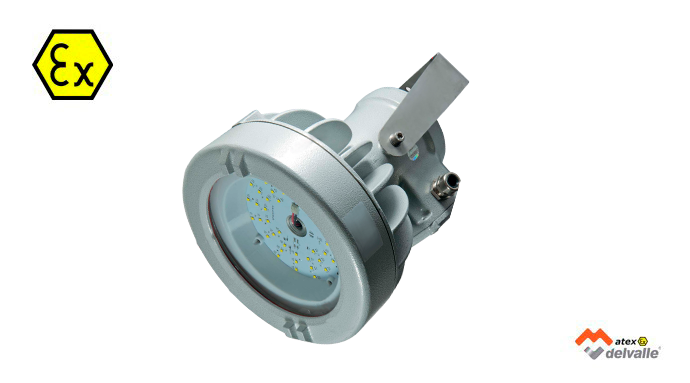 For example, a discharge lamp of 400W can be replaced with a Atex LED lighting fixture of 160W with an energy saving of about 60%. Increased duration. Compared to incandescent lamps, LEDs have a lower loss of brightness over time and a high resistance to shock and vibration; therefore, they have longer life in heavy installations. The useful life of LED systems is estimated at 50.000-100.000 hours (10-20 years, 12 hours a day) respect to 4.000-5.000 hours (11-14 months) of high-pressure sodium lamps an 9.000 hours of mercury vapor lamps (10-14 months, 12 hours per day). According to estimates, the brightness of a LED system after 50.000 hours drops to 70% compared to the initial value and this can be considered the end of the LED useful life. Strong reduction in maintenance operations. The maintenance costs of LED lighting equipment are estimated at around a tenth of the systems currently in use. Quality of light and improved safety (better visibility in critical condition and reliability of the lamp). The light emitted by sodium lamps is yellow, not corresponding to the sensitivity peak of the human eye: not all colors are faithfully reproduced and, therefore, it’s required more light to ensure a safe vision. LEDs, instead, emit cold white light, allowing to reach safe lighting for users (thus lowering the response times for the unexpected), with lower energy consumption. The white light goes through the fog much better and increases the quality of images captured by security cameras. The Color Rendering Index (CRI) indicates the fidelity of color reproduction on a scale from 1 to 100. Sodium lamps have an index of 20, while LEDs equal to 80. Some studies indicate that should be chosen light sources with a spectrum prevailing in the blue band, such as LEDs, without requiring high luminance values. The high-pressure sodium lamps have a spectrum centered in the red band, very outside of the sensitivity peak of the human eye. Reduced environmental impact. The environmental impact is practically zero thanks to the absence of toxic and noxious substances in components such as gases, mercury vapors, sodium, etc.. Furthermore, no emission of heat and ultraviolet radiation are present: any mutagenic potential damage to people and to the pigmentation of illuminated monuments. In addition, a factor not to be ignored because of the absence of these emissions, LEDs do not attract insects.